Swiss ski racer Ramon Zenhaeusern doesn't mind the height jokes. "Because I am tall," he cracked right back. At 6-foot-7 (two meters), he's reaching new heights on the slopes. 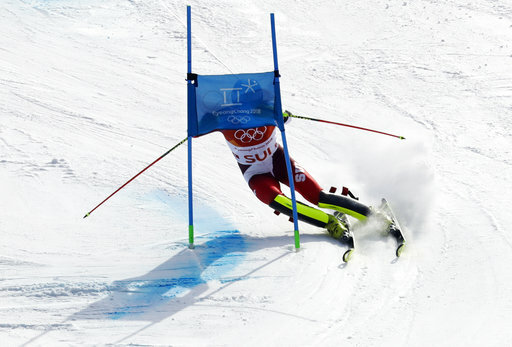 First, he won an Olympic silver medal in the men's slalom. On Saturday, he helped the Swiss team to gold during the Winter Games debut of the team event. "These two medals are the same value," Zenhaeusern said, when asked which one means more. "Because I think to win a gold medal in the team, it's even nicer than individual because there is a big team behind us. To win that together, a gold medal, for me it's the same." When he meets someone new, they usually ask him: Do you play basketball? That's typically followed by: Do you play volleyball? He did play ice hockey as a kid, along with soccer, tennis and of course skiing. He dropped hockey, then soccer and finally tennis when he was about 12. That left only skiing. "A lot of people say to me, 'It's better for you to play basketball or volleyball, but not ski,'" he recounted. Hard to say that now. His father and his coach, two-time World Cup slalom race winner Didier Plaschy, always believed his height wouldn't hold him back. "Everyone else when I was young didn't think it was possible to ski fast at two meters," Zenhaeusern said. He's not the only towering ski racer on the World Cup circuit. American downhiller Bryce Bennett is also listed at 6-foot-7. "We were at world juniors once and it was pretty close," Bennett said. "We need an official measurement."